Woman In Digital: AirAsia Celebrates 300 Million Guests Milestone With P300 All-in Promo Fare! 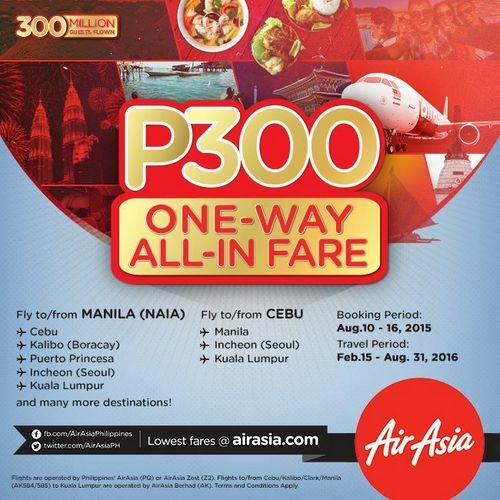 AirAsia Celebrates 300 Million Guests Milestone With P300 All-in Promo Fare! AirAsia celebrates another milestone today as they reached 300 million guests. The achievement was commemorated with a string of celebrations starting from Terminal 3, Soekarno-Hatta International Airport, to The Ritz-Carlton Jakarta, Pacific Place. Jodie Lazuardie, a 30-year-old Art Director based in Jakarta was the lucky guest who booked the 300 millionth AirAsia seat. 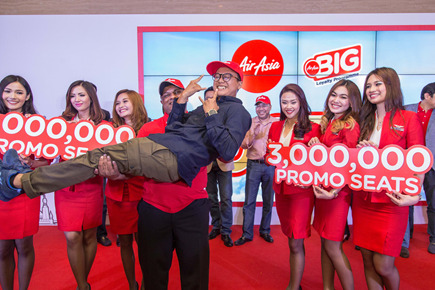 Jodie's flight booking from Kuala Lumpur to Jakarta earned him a once-in-a-lifetime experience and a hefty 3 million BIG Points from AirAsia’s loyalty programme, also known as AirAsia BIG. Jodie was also driven from the airport to The Ritz-Carlton Jakarta, Pacific Place by a private chauffeur, where he was warmly welcomed by AirAsia Group’s management team. Among those present to welcome the 300 millionth guest were Co-Founder and Group CEO of AirAsia Tony Fernandes, Co-Founder and Group CEO of AirAsia X Datuk Kamarudin Meranun, CEO of AirAsia Indonesia Sunu Widyatmoko, CEO of Indonesia AirAsia X Dendy Kurniawan, CEO of Malaysia AirAsia Aireen Omar, Acting CEO of AirAsia X Benyamin Ismail, CEO of Thai AirAsia Tassapon Bijleveld, CEO of Thai AirAsia X Nadda Buranasiri, Chairman of Philippines AirAsia Maan Hontiveros and Alice Goh, CEO of AirAsia BIG. Commenting on the achievement, Tony Fernandes said, “We are delighted to be here today to welcome our 300-millionth guest. When we started AirAsia fourteen years ago, we merely had two aircraft in operation supported by 250 staff across five destinations in Malaysia. Today, we have established operations in 5 countries including Malaysia, Indonesia, Thailand, Philippines, and India with over 17,000 Allstars. We paint the sky red everyday with 199 aircraft flying to over 100 destinations in 22 countries. It took hard work and sheer determination to get to where we are today and together, we will continue to revolutionize air travel, to serve the underserved, and most importantly, to give back to the communities in which we operate." Datuk Kamarudin Meranun, Co-founder and Group CEO of AirAsia X said, “AirAsia has made flying affordable for millions of people and has turned millions of dreams into reality – a pledge we will continue to enshrine. Today, our dream of flying 300 million guests has come true with the support of our loyal guests. We are committed to continue putting our guests at the core of everything we do, and to consistently innovate in making their travel experience hassle-free and enjoyable. We hope to connect more places, more people, and more communities through AirAsia and AirAsia X’s low fares and unmatched route connectivity." AirAsia Group Celebrates 300 Million Guests Milestone with P300 all-in promo fare! To celebrate the 300 million guests milestone, AirAsia Group announced celebratory fares on 3 million seats from as low as P300, all-in fare and one way. Guests can fly to many exciting destinations across Asia and Australia, such as Singapore, Kuala Lumpur, Maldives, Manila, Hyderabad, Seoul, Osaka, Tokyo, Melbourne and Sydney.